The UCSF Academic Senate passed an Open Access Policy for UCSF on May 21, 2012. See a 90-second video for an overview, and find more details here. 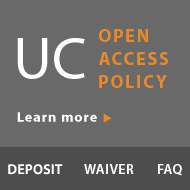 UCSF Academic Senate faculty can use the UC Publication Management system to upload their publications to eScholarship (UC's open access repository). Other authors must log in to eScholarship directly to share their works.